welcome to propyield. commercial property analysis made easy! 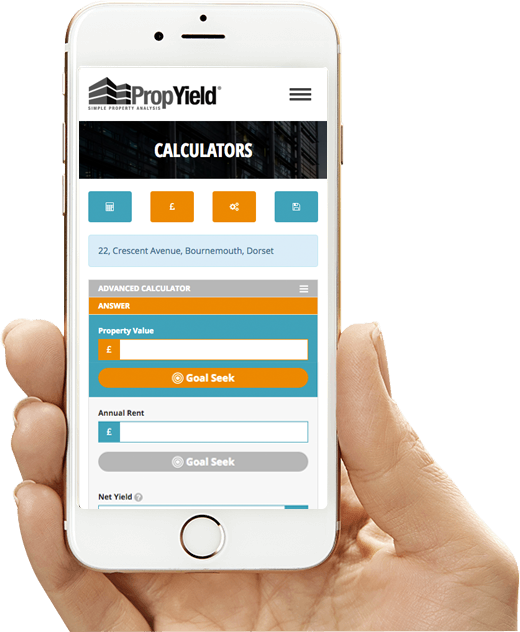 The PropYield calculator is the UK's leading online property investment tool. Click the button below to experience the great benefits of this quick, accurate, easy application. Signing up to PropYield is fast, easy and straight forward. You will have your own account where you will be able to save your calculations, email calculations and even download and print. You will soon be able to download our calculator in the App Store. The App is super fast and can be used offline. Sign in and save your calculation, then print it from 'Saved Calculations' section. Need to sign up? Click here to create an account. Enter your email address, and we will send a password reset email to you. Simply click on the link in the email to reset your password. Please validate your email address, then click here to continue. Please fix the following issues!